A new limited edition by Simon Atack to commemorate a magnificent era in aviation history, and to perpetuate the memory of one of the finest aircraft ever built..
Unquestionably the most beautiful commercial aircraft ever to enter service, during 27 years of flying passengers supersonically, Concorde earned a unique place in aviation history. To watch this remarkable aircraft thunder down the runway at London's Heathrow airport, with afterburners belching flame in a crescendo of deafening sound, but for her distinctive airline livery one could be excused for thinking a mighty warbird was scrambling. Yet aboard, a hundred passengers, relaxing in sumptuous comfort, are looking forward to arrival in New York effectively before they left — such was the speed of this remarkable airliner as she travelled westward faster than the sun. Lifting off at 250 mph, her nose pointed skyward as the four Rolls Royce Olympus engines, each delivering 38,000 Ibs of thrust, propel the delta winged giant towards the stratosphere. As speed picks up, the droop-nose section, lowered for take-off and landing to improve pilot vision, raises to accentuate the elegant profile of her slim fuselage. Climbing towards 60,000 feet, Concorde passes through the sound barrier, continuing to accelerate to 1,350 mph and levelling off at more than twice the speed of sound. In the thin, ice-cold atmosphere eleven miles above the earth, the heat generated by her speed is such that Concorde's slender fuselage expands by up to 10 inches; her special paint, developed to accommodate these temperature changes, helps to dissipate the fearsome heat of supersonic flight. As the cabin crew serve champagne and caviar, passengers gaze out to witness the world from the very edge of earth's atmosphere, the curvature of the planet clearly definable under the mid-night blue of deep space. Far below, white contrails of lumbering 747s seem as far distant as when viewed from the ground. Propelled by the most powerful pure jet engines to fly commercially, Concorde will descend into New York's JFK airport just 3 hours 20 minutes after take-off - a 747 averages over 7 hours -delivering her passengers across the Atlantic to arrive earlier in the day than the time they left London. As the mighty bird makes her final approach, the steep angle of approach producing huge swirls of vortex off the delta wingtips, this miracle of aviation touches down in a familiar cloud of blue smoke. A spectacle of awesome beauty. To commemorate a unique period in the history of aviation, and to mark the end of commercial supersonic flight, Simon Atack has painted a wonderfully atmospheric picture which beautifully captures the majesty and power of this unique and much loved aircraft. 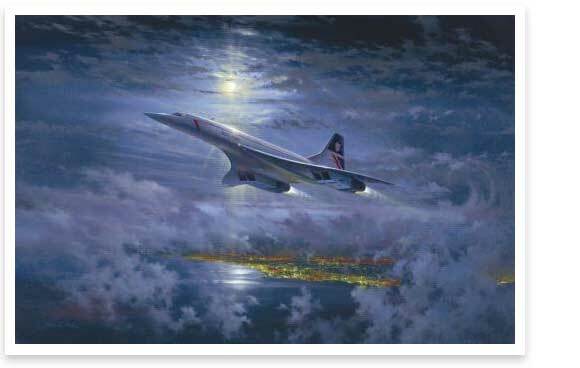 Every print in this fabulous new limited edition from artist Simon Atack is signed in pencil by SIX senior British Airways Captains who flew the BA Concorde fleet. After flying VClOs, Mike Bannister became a pilot on the Concorde fleet in 1977. Master of the Guild of Air Pilots and Air Navigators from 1990-91, he was Captain on the B757/767 fleet from 1992-95, Flight Manager on Concorde from 95 -2002, and BA General Manager on Airbus, B757/B767, Concorde and Gatwick fleets, and Chief Concorde pilot from 2002-04. Mike flew the last ever Concorde. Starting out on BAs 737 fleet, Paul moved on to DC 10s, progressing to Senior First Officer. With the opportunity to join Concorde as Senior First Officer in January 1998 he leapt at the chance. In 2000 Paul moved to BA's Airbus fleet as Captain, and in 2004 transferred to become a Captain on the Boeing 777. James joined BA flying the Boeing 757/767 fleet. After ten years experience, he joined the Concorde fleet as a Senior First Officer, but following the grounding of Concorde he flew as Captain on the 757/767 fleet. On Concorde's return to service in 2001 he demoted himself to Senior First Officer so that he could return to Concorde. Currently a Training Captain on 777s. After flying as a co-pilot on Tridents and Tristars, Paul joined the Concorde fleet as a co-pilot from 1988 to 1997. For two years from 1997-99 he was a Captain flying the Airbus A320, before returning to Concorde as Captain from 2000 until it's retirement, flying the last VIP LHR-LHR in G-BOAF. He is now General Manager Flight Operations. Chris joined BA in 1969 on VClOs and spent 8 years as co-pilot. In 1977 he went on to the Concorde fleet as a co-pilot, spending the next 11 years with the Concorde fleet. Returning to fly sub-sonic 737s, 757s and 767s, he finally returned to Concorde in 1997 as Captain until his retirement in 2003. After a spell on BAs Boeing 757/767 fleet, Mark transferred to the Concorde fleet in 1998, remaining there until Concorde retired from service. Mark then transferred to the Boeing 747-400 fleet where he recently became a Captain. In his spare time Mark is a skilled acrobatic .competition pilot. Speedbird has been a very popular print and we expect demand to be high for these special editions.